AMMAN — Jordan works with the US, Russia, Europe and all active powers in the international community towards achieving peace in the Middle East, but “we state our positions clearly and frankly”, Foreign Minister Ayman Safadi said on Sunday. 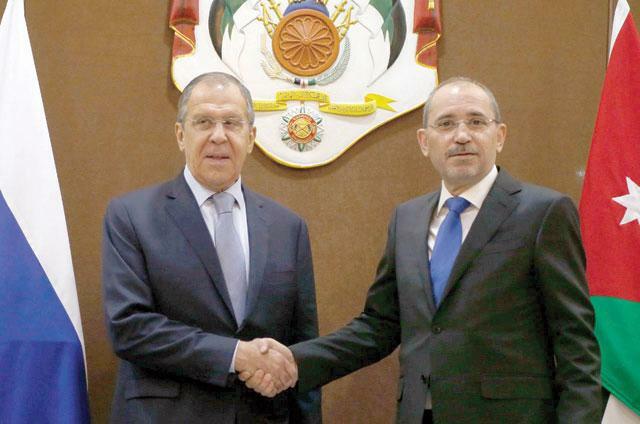 In a joint press conference following talks with Russian Foreign Minister Sergey Lavrov, Safadi said that Jordan has no details on a peace plan for the Palestinian-Israeli conflict proposed by the US, dubbed “the deal of the century”, but Jordan’s constant and clear position remains that the only path to ending the conflict is an end to occupation and attaining the full legitimate rights of the Palestinians on the basis of a two-state solution that guarantees the Palestinian people freedom and statehood on their national land with East Jerusalem as a capital. Safadi noted that Israeli statements on the annexation of settlements and imposing sovereignty over the West Bank indicate moving towards further escalation in the Palestinian-Israeli conflict, the Jordan News Agency, Petra, reported. “There is an occupation, there are people living under occupation, and there is a genuine international and Arab will to achieve peace based on the known pillars and conditions, which, if unfulfilled, will lead to new escalations,” the foreign minister told the press. The conditions in the occupied Palestinian territories are “very difficult and very dangerous”, Safadi said, noting that killing prospects for a solution would only fuel the conflict. For his part, Lavrov said that Russia is concerned about the recent developments in the Palestinian-Israeli conflict and has no doubt that the international community must adhere to the Arab Peace initiative and relevant international resolutions. He stressed that Russia’s stance in support of a two-state solution is clear, adding that his country condemns the US decisions on Jerusalem and the Golan Heights, describing them as illegitimate, according to Petra. On Jerusalem, Safadi reiterated His Majesty King Abdullah’s position that Jerusalem “is a red line”, that will not be conceded or compromised. The top diplomat hailed Russia for its support of the two-state solution, which is the sole path towards lasting, comprehensive peace, stability and security in the region, he said. Meanwhile, Lavrov called for an immediate closure of the Rukban camp near Jordan’s north-eastern border with Syria. Citing UN observers who visited the camp, Lavrov said that most of the displaced people there want to return home. The top diplomat also called for a stop to attempts to prevent the displaced people from leaving the camp, where 50,000 to 60,000 Syrian refugees live. Lavrov reiterated Moscow’s rejection of the American presence in Al Tanf, noting that the solution to the Rukban problem is through the return of the refugees there to their hometowns. Agreeing with Lavrov, Safadi said that the only solution to Rukban camp is the return of refugees, adding that Jordan is in discussions with Russia and the US over this issue. Safadi also said that the Rukban issue is an integral part of the Syrian crisis as a whole, reiterating the need for a political solution to the Syrian crisis that can end the large-scale suffering of the Syrian people and safeguard the territorial unity of their country. “Jordan has long borders with Syria extending to 378km and we cannot live an open war in Syria and that is why finding a political solution to the Syrian crisis is a top Jordanian priority, sought in coordination with our Russian and American friends and the rest of the international community,” Safadi said. The two ministers stressed during the conference that Amman-Moscow ties are on a fast-track advancement towards further cooperation on all levels. They affirmed that both countries are keen on signing more agreements to enhance economic, trade and tourism cooperation, according to Petra. Safadi noted the the two countries’ joint committee met last year “for the first time in three or four years”, agreeing on implementing many projects and deals this year. “Our relations are built on mutual candour and trust… and they are clearly moving fast towards more cooperation,” Safadi said.